So this week, you get to be my homework assignment! you're probably going to have to make a YouTube video. At the very least, outline your main points. what you want them to do! Including subscribe to this channel! so you never miss an episode. Basically, use what you have. or webcam. If you have the money to upgrade, go for a DSLR. Natural light is free. So it's free and your friend. You can also get beginner lighting kits on Amazon starting around $30. I use a ring light. I'll leave the link to that down below. Check your audio as well. just make sure your environment is as quiet as possible. make sure you've got enough memory. Back any important files you might need. Don't be afraid to do more than one take. And you don't have to start over again from the beginning. Just rewind ten seconds and do it over again if you screw up. You're also going to need way more energy on camera than you think you do. If you're uncomfortable, the people watching know you're uncomfortable as well. And usually that's not really endearing. that you can also use on an ipad or an iphone or an Android. Because it's not actually a youtube video until it's on youtube. 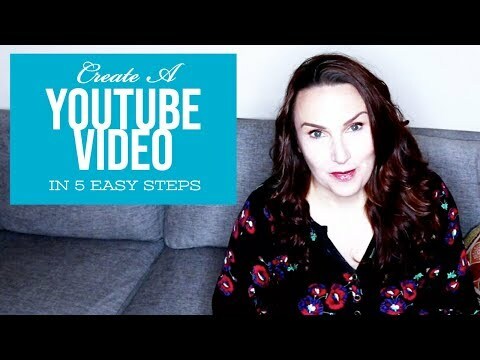 So for this video "How to Create a YouTube Video"
Make sure to add the links that you talked about in the video and your call to action. "how to make a youtube video" "Making a youtube video"
Go back in and click "EDIT"
Add an end screen with a link to subscribe to your channel and to the video you'd like folks to watch next. Also make sure you go in and add the closed captioning. other things because you can't pronounce the word "HORROR" correctly. When you really mean you write scary stories, okay? So help people find your content. Make sure to subscribe to my channel if you haven't already. head on over to Patreon.com and become a patron. And you can subscribe why you're there. Thanks again. I'm Anna Yeatts and I'll see you in the next video!